It was one of the biggest upsets in Oscar history. Judy Garland, who'd been off the screen for four years, wowed critics with a spectacular screen comeback in the kind of music drama she'd never been assigned in her famous MGM years. She starred in the first musical remake of A STAR IS BORN, a film that expertly combined the bright Technicolor and romance of musicals she'd made famous with dark elements of excess, self-destruction, self-loathing and sacrifice. Vicki Lester is now a singer with a band. She'll be discovered by alcoholic Norman Maine, a big movie star whose star is falling as he enables hers to ascend. They will fall in love. Hollywood will fall in love with her. So will the public. Hollywood will reject him because of his drinking. Loving her will be his redemption. She believes her love can make him stop drinking. In short, the 1954 remake of A STAR IS BORN shows the high and lows of stardom. Director George Cukor focuses on the dreamer and what happens after her dream comes true. Her dream was to have a hit record. Norman Maine sincerely tells her that "the dream isn't big enough." He adds, "Don't settle for the little dream. Go on to the big one." And we get some great got original music -- most notably, "The Man That Got Away." 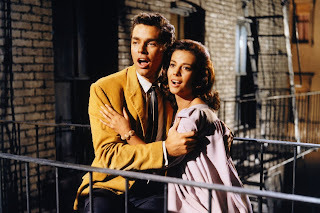 The Best Song Oscar nominee became one of Garland's signature tunes for the rest of her life. Today's critics raved that LA LA LAND was great musical. It got 14 Oscar nominations. More Oscar nominations than THE WIZARD OF OZ, MEET ME IN ST. LOUIS, THE BAND WAGON, THE KING AND I, WEST SIDE STORY and THE SOUND OF MUSIC. I've seen LA LA LAND more than once yet I can't remember the words to a single song in it. I love Emma Stone and Ryan Gosling. However, the first time I saw it, I felt like the odd man out for disagreeing with the critical raves. It was nice to look at and the musical numbers were creatively shot, but the whole thing was like a really pretty Christmas gift box displayed in a Macy's window. It was pleasing to the eye but there was nothing inside. In fact, when it ended the first time I saw it, an older woman in the audience said in an Ethel Merman-like voice, "That's it?!?! Well, it's no FUNNY GIRL." She's right. The millennial musical was no FUNNY GIRL. But it got 14 Oscar nominations. Gosling and Stone played two young show biz hopefuls living in Los Angeles who meet and have a romantic attraction. She works behind the counter at a coffeeshop and goes to some humiliating auditions. Vicki Lester (Garland) will also have a coffee & fast food service gig to pay the rent before she gets a big break, thanks to a very honorable Norman Maine (played brilliantly by Best Actor Oscar nominee, James Mason). If you love LA LA LAND, here's what I beg you to do. 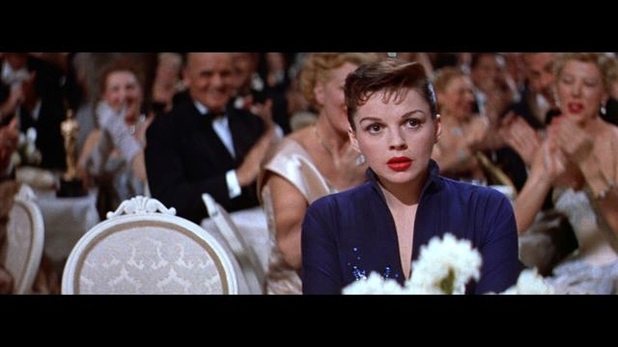 Watch Judy Garland in at least the first half hour of A STAR IS BORN. Just like in LA LA LAND, you will see two performers in Los Angeles who meet and are romantically attracted to each other while trying to have good career luck. Movie star Norman Maine sees that the anonymous singer with the band is far more talented than she realizes. He'll see this when she sings "The Man That Got Away." Notice that the number runs about 4 1/2 minutes and it's shot in one continuous take. No edit. Also, Garland sang along with the playback. She didn't just lip sync. If you stay through the rest of the film, and you should, there's the "Born In A Trunk" number. The last act has Garland in a soundstage dressing room breakdown scene. Vicki Lester confides to the studio head that Norman's drinking has shattered her life, but she still loves him. She has this riveting emotional scene during a short break while filming a jazzy, optimistic musical. Judy Garland never won an Oscar in her career. Vicki Lester won an Oscar but Judy Garland never did. She was nominated twice. She should have won for A STAR IS BORN. I do not mean this disrespectfully. However, if Emma Stone won Best Actress for LA LA LAND, then Judy Garland should have won Best Actress for A STAR IS BORN. It's a magnificent performance that takes you on quite an emotional journey. We watch Garland's character go from being Esther Blodgett to becoming Vicki Lester and then Mrs. Norman Maine. And that singing voice....absolutely amazing. A HAIR Cut for NBC? What Would Harvey Milk Have Said About That?